When Henry Reed's career is summed up into a few paragraphs for a reference book or introduction, his varied jobs are usually listed in descending order of how he is remembered: poet, radio dramatist, translator. On occasion, the title "journalist" is added, but what they really mean is freelance critic: writing book reviews. Reed was the fiction critic for the New Statesman from 1944 to 1946, and wrote the "Radio Notes" column there from 1947 to 1948. He reviewed fiction in the Listener from 1946 to 1947, and again during 1950 and 1951. Here and there he was commissioned to write pieces on poetry collections or translations, and he was a frequent contributor to the Radio Times when he was writing scripts forand giving talks onthe BBC. 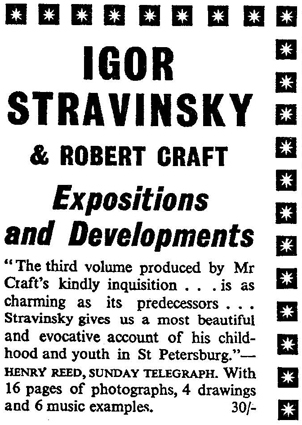 At least twice in the early 1960s, Reed reviewed books for the Sunday Telegraph, and there are probably more. I don't have any sort of access to the Telegraph locally, however, so a dedicated search will probably have to wait for another trip to the Library of Congress. A book described in last Sunday's Observer as one of 'almost indigestible richness' seemed to have been digested pretty well by Mr. Henry Reed, writing in the Sunday Telegraph, and not found all that rich, either. Mr. Reed was not too happy about the translation, to start with. He happened to know that the original version of Georges Simenon's Pedigree (Hamish Hamilton) was written in the present tense, and thought that the translator had lost something by putting the English version in the past tense. Mr. Anthony Burgess, who wrote the Observer review, regarded the translation as admirable, as did Mr. Raymond Mortimer in the Sunday Times. But Mr. Reed was also worried about the original; the reader was likely to get helplessly lost, he thought, among the 'phalanxes of aunts and uncles' who drifted in and out of the story. Mr. Burgess thought that the author's characters were convincingly solid and one could walk around them because they filled real space. This reviewer judged the book as a remarkable work of art, and thought that M. Andre Gide's advice to the author to recast an earlier autobiographic version as a novel in the third person was good. Not so for Mr. Reed; for him, M. Gide's advice was 'rather insensitive'. Mr. Mortimer's review of M. Simenon's book was notable for, in the midst of his customary sound appraisal, an anecdote which must not go unrecorded in this paper. The book ended, observed Mr. Mortimer, with the hero at the age of fifteen; he had 'just been sacked from his first job (in a bookseller's) because he knew more than his employer'. I also have a few intriguing but disappointingly unspecific references to reviews penned by Reed for the Sunday Times. If I can find my notes, I'll have to post something on those. If for no other reason, so I can easily look it up the next time I'm in a library with British newspapers on microfilm, at least until Sundays appear in the online archive for the Times.